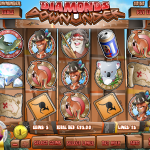 Diamonds Downunder is a slots game taking place downunder or Australia if you didn’t get the hint. Rival must love our childhood heroes otherwise they wouldn’t have developed a game taking place downunder. The game offers a very wide range of betting starting just at $0.01 and getting high as $1. The jackpot gets as high as 5000 coins you could potentially win very big. Not too bad mate! The scatter in this game is the Aboriginal Warrior. 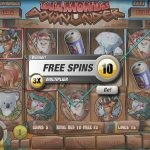 If you land 3, 4 or 5 of him you will get 10, 20 or 100 free spins!! As you can see they are pretty generous here! Also, every win during the free spins round will win you 3x of your winnings! Another scatter is the Treasure Map symbol. Getting 3 or more anywhere on the reels will trigger the Bonus Round. In this round you’ll be asked to select locations on the map where you think diamonds might be. A miner then will uncover the rock and mine the diamonds. The more diamonds he finds the bigger your prize! 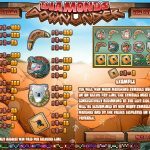 As with many others of Rival’s game, Diamonds Downunder is pretty fun. It’s not that difficult to trigger both of the scatters. The only “bad” thing would be the game’s graphics and sound. Not the best in the industry but it’s not something that would prevent your enjoyment completely. Love adventurous? Try playing Jenny Nevada a 5 reel slot by Rival.